Techcrunch just published some interesting numbers from Facebook's eMagazine for its partners. The data provides a regional break-up of Facebook's total and mobile active users. These figures show that Facebook is truly a mobile internet company. 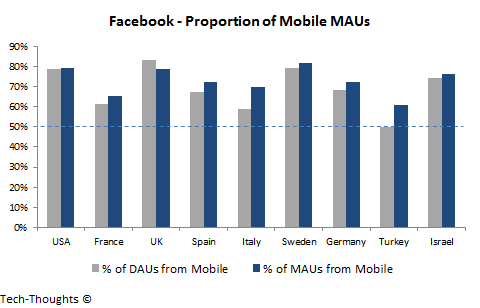 The chart above shows the proportion of Facebook's Monthly Active Users (MAUs) from mobile in each listed country. Among these countries, at least 50-60% of users access Facebook for a mobile device -- this figure is as high as 80% for markets like Sweden, USA and UK. 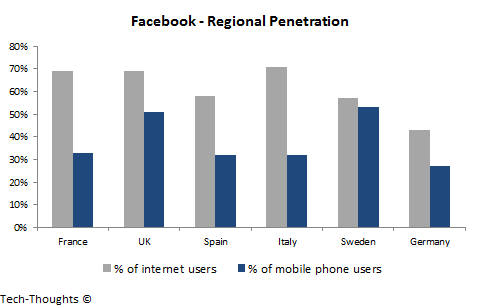 The chart above shows Facebook's regional penetration among internet users and mobile phone users. As smartphone penetration rises, Facebook's mobile penetration is likely to rise. However, I'm unsure how high that would be relative to Facebook's current levels of internet penetration. First time internet users (including teens and emerging market users) on mobile are likely to move directly to modular social apps (messaging, photo sharing, etc. ), that are integrated by the smartphone interface. Since these services directly compete with Facebook for user attention, I expect an increase in their acquisition efforts over the next few years. This isn't an outcome of Facebook's need to remain a social monopoly, but is a defensive strategy against the gradual loss of user attention. The Instagram acquisition was just the beginning.